What is a pyrometer and what is it for? 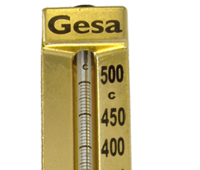 Technically a pyrometer is an instrument that is used to measure very high temperatures when a thermometer with probe falls short. In our industry we consider pyrometers to any thermometer capable of measuring temperatures above 300°C, whether or not there is direct contact with the measured object. - Fixed pyrometers: These pyrometers are installed in systems such as motors or furnaces. The systems include insert points for measuring instruments that are secured by means of threads, flanges or protective sheaths. 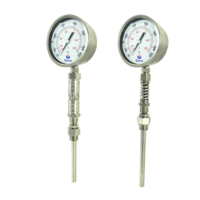 There are pyrometers for fixed installations of different types, they can be chapel thermometers with glass rod filled with mercury or dial pyrometers with a straight bulb or with a capillary tube of several meters. 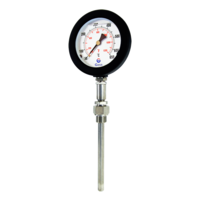 Each type of pyrometer is adapted to specific needs derived from its application, thus, a furnace pyrometer will usually need a long stem that reaches the area to be measured; while an exhaust pyrometer for the gases of an engine will require an anti-vibration system. - Pyrometers without contact: Non-contact pyrometers are also known as infrared pyrometers, laser pyrometers (erroneously since the laser only serves to aim) or optical pyrometers. These pyrometers use thermal radiation to determine the temperature of a surface: a lens picks up the infrared thermal radiation and focuses it on a detector that converts it into an electrical signal. This system allows remote measurements, always observing the D: S (distance-surface) ratio and the emissivity inherent to the material of the surface to be measured. How and where are pyrometers used? Pyrometers perform measurements in environments at very high temperatures such as furnaces or exhaust systems in ship engines. According to its measurement principle the use varies, being able to be installed inside the system, for example threaded to the wall of an oven, or used at a distance in the case of infrared pyrometers.